I walked past the common bedroom and suddenly saw a flurry thing outside the window. She managed to squeeze herself through the small opening of the window, and sat on the outer windowsill. Our condo's window design is a bit odd. The windowsill is outside instead of inside the window frame. So, now Creme is 'external' to the building. 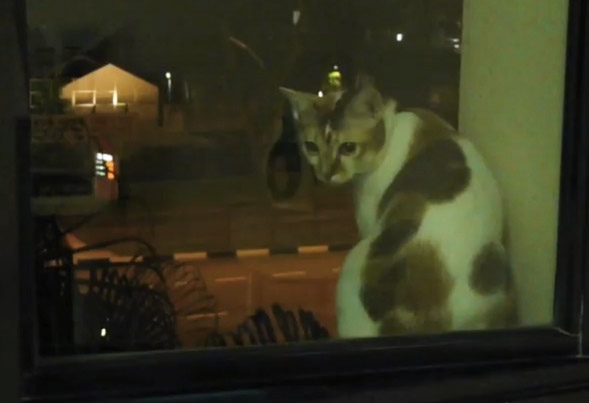 When she saw me, she immediately got up from her sitting position and walked to the other side of the window, fearing that I might catch her and bring her back in. After luring her with my finger snaps (we usually snap our fingers to denote food for her), she realised that I had no food with me and she turned back. I had to stop filming and grab her back. I'm sure there are more episodes of such kind which didn't get noticed by us.